The new stainless steel versions are ideal for challenging corrosive applications requiring a durable pump that can move liquids ranging from thin to highly viscous. 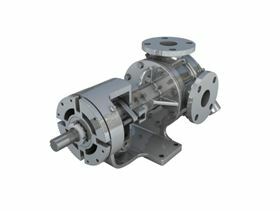 G Series internal gear pumps are available in cast iron and stainless steel construction with 1-1/2” to 3” port connections. Stainless steel models are rated from 10 to 110 gpm, and cast iron models range from 15 to 140 gpm. Both models are capable of pumping viscosities up to 431,000 cSt. In addition, G Series pumps are interchangeable with up to 95% of internal gear pumps currently available on the market. No changes needed to piping, driver, coupling, flow rates or baseplates. Operating equally well in both directions, G Series pumps provide a positive, non-pulsating flow with only two moving parts for easy maintenance. The enlarged bearing housing at the rear end of the pump allows convenient drive-end access to the shaft seal and single-point end-clearance adjustment. The pump casing revolves for easy multiple inlet and outlet positioning. The Vortex Series is designed for waste handling, sludges and industrial effluent.